Yesterday was one for the books. Well, not for me really. I actually just got to mope around the house all day long missing my Mom and my Dad, expected to exist on food and water but no cuddles and nobody calling me a good boy. I was so excited when my parents came home, I could hardly sit still to hear all about it. There were toys to be thrown and ears to be scratched. However, I knew all of you were sitting at the edge of your seats waiting to learn about everything that went on at the Virginia Governor’s Cup Gala last night, so I made myself put my best listening ears on and got all the details for you. The Governor’s Cup Wine Gala gives all wine lovers a chance to taste the best of what Virginia wine has to offer. All wines served at the gala have been through a series of rigorous judging and have all been awarded a gold medal from the Governor. The event was held in the the newly remodeled train station in downtown Richmond. All of the wineries were set up on tables that lined the main hall. Each table was shared by two vineyards, so it was especially easy to make your way through the offerings. The center of the room was filled with standing cocktail tables and long spreads of delicious foods. The fare was decidedly southern with a lean toward selections that were good for wine pairing: country ham sandwiches on sweet potato biscuits, southern antipasto, shrimp and grits, decadent cheeses, crab cakes, baked brie cups, pecorino meatballs, and so much more. Everyone was able to get plenty to eat AND go back for seconds. The tasting tour was interrupted briefly to honor the recipients of the Virginia Wine Person of the Year and the Lifetime Achievement awards, to recognize the wines that made it into the Governor’s Case, and to announce the winner of the prestigious Governor’s Cup. The honor of Wine Person of the Year was given posthumously to Frank Britt who began the “Official Virginia Wine Lover” publication and also started the James River Wine & Music Festival. Mr. Britt garnered such notice and publicity for the Virginia wine industry that his contribution could not be overlooked. The Lifetime Achievement Award was given to Lucie Morton, a native Virginian, who is an internationally known viticulturist. Ms. Morton is best known for discovering one of the fungus that causes the dreaded “black goo” that can decimate vineyards if not treated. She manages several vineyards in Virginia and also consults with vineyard owners around the world. The wines selected for the Governor’s Case were a varied mix of red and white varietals and a sprinkling of blends and dessert wines. Jefferson Vineyards had two Viogniers place: the 2015 was fermented in a combination of oak and stainless, while the 2016 was done entirely in oak. Keswick Vineyards and Potomac Point Winery both had their 2016 Cabernet Francs selected. Three Petit Verdots were chosen (all 2015): The Barns at Hamilton Station, North Gate Vineyard, and Veritas Vineyard & Winery. Blends are often seen as the perfect marriage that brings out the best characteristics of the varietals that they contain, and three made their way into the case this year. They were The Barns at Hamilton Station Meritage (2015), Early Mountain Vineyards Eluvium (2015), and King Family Vineyards Meritage (2014). Every good meal deserves a good dessert, and this case provides two very special dessert wines: Barboursville Vineyards 2014 Paxxito and Cross Keys Vineyards 2015 Ali d’Oro. Governor Ralph Northam gave King Family Vineyards 2014 Meritage the distinct honor of winning the 2018 Governor’s Cup. This blend of 50% Merlot, 23% Petit Verdot, 21% Cabernet Franc, and 6% Malbec was fermented for 2 months before being gently pressed. The resulting juice was put through malolactic fermentation in barrels and aged for 18 months in 50% new French oak. Matthieu Finot, the winemaker for King Family Vineyards, made his way to Virginia after working in vineyards throughout France, Italy, and South Africa. He brings a depth of experience that is evident in the subtle complexity and undeniable deliciousness of his wine. 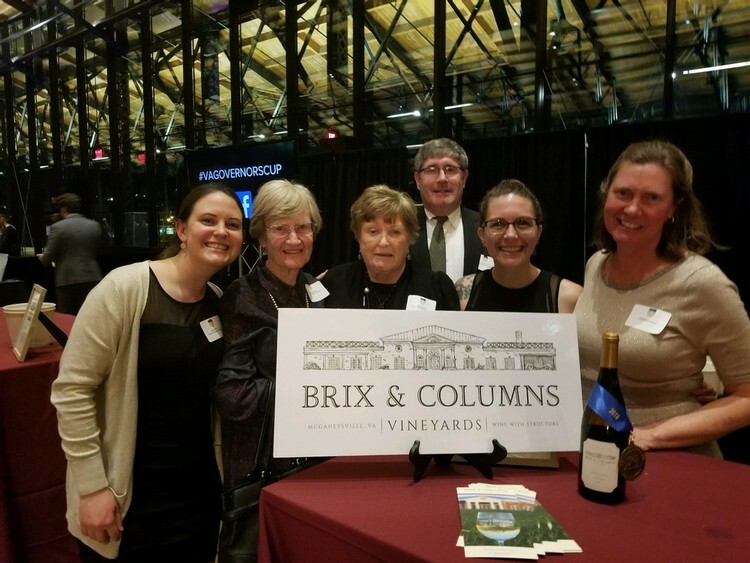 I know that not all of you were lucky enough to attend the gala, but Mom and Dad tell me that every single one of the wines selected for the Governor’s Case can be easily tasted by taking a few day trips around Virginia. This should be music to your ears and magic to your taste buds! What Mom and Dad didn’t realize was that they didn’t need to leave the Shenandoah Valley to receive the best news of all. Yesterday, legislation was passed in Virginia that repealed that pesky rule that kicked me out of the tasting room. That’s right, folks, starting on July 1st of this year, I will be allowed back in the tasting room. I can’t wait to visit with each one of you without the doggie gate between us!